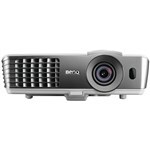 Benq Ht1075 Full Hd 3d Wireles.. The two hdmi ports and built-in speaker makes it easy to setup and use. It features 2200 lumens brightness which gives bright vivid colors. The projector has 10000:1 contrast ratio for sharp crystal clear images. It also features smart eco technology and has up to 235 inches diagonal image with whisper quiet operation. BEQHT1075 Features: Home Theater Projector, Full 3D 1080p Resolution, 2200 ANSI Lumens Brightness, 2 HDMI Ports, Smart Eco Technology, Up to 235 Inches Diagonal Image, 10000:1 Contrast Ratio, Built-in 10W Speaker, Projection Installation Flexibility, MHL, D-Sub & composite, NTSC, PAL, SECAM Video Compatibility, 240W Lamp Type, Box Includes, 1 x Projector, 1 x Remote Control w/ Battery, 1 x Power Cord, 1 x User Manual CD, 1 x Quick Start Guide, 1 x Lens Cover"